Markham College officially runs a cricket programme for junior boys and girls using coaches provided by Cricket Peru. With the aid of ICC Development Grants, the playing fields of the Upper School now boast an artificial pitch – the setting for the 2011 ICC Americas (South) Under-15 Championship – and a net. Another school, Hiram Bingham has also started a regular cricket activity for both boys and girls using Cricket Peru coaches. Cambridge College in the south of Lima now has an artificial cricket wicket, built with an ICC Development Grant, and this is to be used by the students, as well as providing an excellent training facility for the adults. 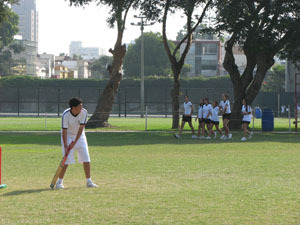 Newton College initiated junior cricket in 2010, with coaching and support provided by Cricket Peru’s Development Officer. San Silvestre Girls School has an intermittent cricket programme. These schools’ programmes culminated in a four-team Inter-Schools Trophy between Markham, Newton, Cambridge and Hiram Bingham. The inaugural tournament was held at Lima Cricket Club on Sun, 21st Nov, 2010, with Markham emerging triumphant. For full details click here. In April, 2010, Cricket Peru had the honour of hosting the inaugural Cricket South America Under-13 Boys Championship, at the Lima Cricket Club. The inexperienced Peru team, led by Sjoerd de Witt, scored a nail-biting victory over Chile in the Twenty20 competition, and the Peru ‘Vicuñas’ won the Cricket Veloz 7-a-side trophy. For full scorecards and reports, click here. An Under-13 and Under-17 tournament are now a regular, annual fixture, with the venues alternating between the participant South American nations, Argentina, Brazil, Chile, as well as Peru. Since the successful 2010 tournament, Lima has hosted in 2011 and 2015, with pupils of the above private schools providing the vast majority of the players. 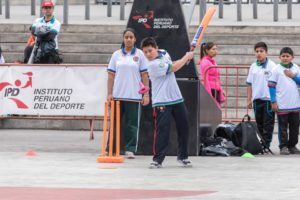 However, the 2016 Under-13 junior tournament in Poços de Calda, Brazil, saw the first fruits of Cricket Peru’s junior outreach programme being borne. Three of the team were from Magdalena del Mar, which has been the location of twice-weekly coaching sessions for all-comers – girls and boys – in conjunction with the district council. With the support of Peru’s Instituto Peruano del Deporte, coaching programmes have now started in a number of Lima’s less affluent neighbourhoods, including San Juan de Lurigancho and Villa Maria del Triunfo, and it is hoped that they will provide international youth and adult players in the future.